Baking Sticks Chocolate Chip Cookies aka Margarine Box Chocolate Chip Cookies get their name from the fact I originally found the recipe on the back of a box of I Can’t Believe It’s Not Butter Baking Sticks. Years later I found the same recipe on a the back of a box of Aldi brand margarine. So maybe the recipe was originally developed with margarine, but the good news is also works well with salted butter. When made with margarine, the cookies are a tad softer and just slightly cakier. When made with butter they are still soft, but a little denser and firmer. Both variations are great. 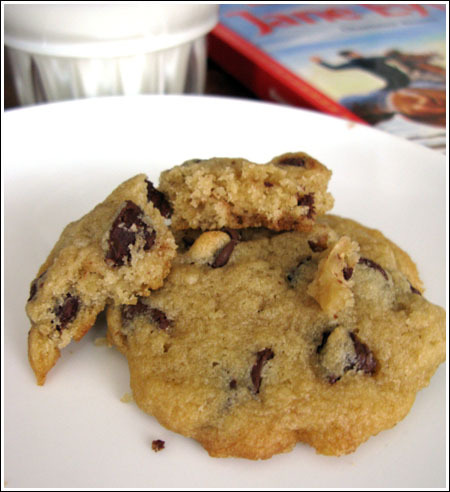 A thick, dense chocolate chip cookie recipe that works well with butter or margarine. If using margarine, use the stick type that has at least 100 calories per tablespoon. Preheat oven to 375 F. Have ready a parchment lined baking sheet. Combine flour with baking soda in small bowl; set aside. Beat the baking sticks with sugars in large bowl with electric mixer until blended, about 2 minutes. Beat in vanilla, egg and salt. Beat in flour mixture on low speed just until blended. Stir in chips. Drop mixture by heaping tablespoonfuls, 2 inches apart, on ungreased baking sheets. Bake 9 minutes or until edges are golden. Remove cookies to wire racks and cool completely. JU\ust made them they are AMAZING but i used real unsalted butter :)!!!!!!!!!!!! 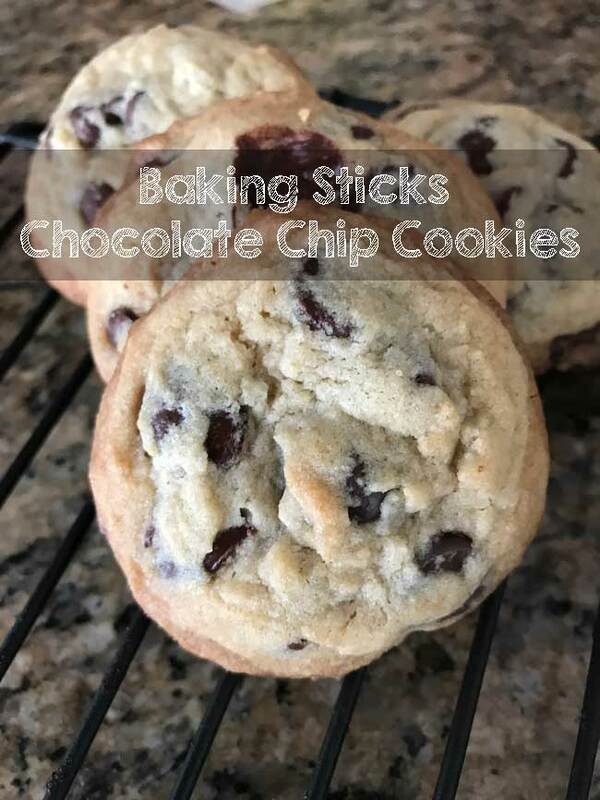 I tried this recipe the other day, and made a pan of cookies, rather than individual cookies and it still turnout out great, just kept them in a 9 x 13 glass dish for 25 minutes…delicious! Mmm, the cookies look delicious. I’ve never worked with I Can’t Believe It’s Not Butter, but I’m really interested to check it out now! I’ve tasted it once (on toast) and let me tell you I could believe it was not butter! I’ve never baked it it, but I’m guessing it will behave similar to regular margarine. I just think the name is funny and great marketing! Teasing – they look yummy! I would love to give these a try. My favorites are the Tollhouse ones…. We love Jamie and Bobby, and know their sweets are unbelievably delicious. Can’t believe the butter sub though…considering the gene pool. wow! i never would have thought the flavour would be that similar. Glad to see your results. I bought this butter last week but have been too busy to try it. I think I am inspired to now…Thanks! Evidently the lower saturated fat isn’t helping the Deen boys slim down. Paula would deep fry the dough. Those look so good I can’t believe they are made without butter!! haha. Thanks once again Anna! I’ve been seeing a lot of magazine ads for the I Can’t Believe sticks. The photo always makes me crave fresh chocolate chips. Knowing that you liked the results is even more of an incentive to try it out. it was noticeable? hmmm, don’t know if I wanna go there. I love the taste of butter with the brown sugar: a flavor that hard to recreate. i’m so excited to see this post! i just saw a commercial for this new product and was very curious about it! (I use QUITE a bit of butter so I thought maybe a recipe every now and then with slightly-more-healthy butter wouldn’t kill me!) i like hearing that they are soft right out of the frig, thats terrific for those super impatient baking moments. Thanks for the report! ooh wow! i wonder what paula would think of them 🙂 i’m sure she’d think they were fantastic! Louise, I’d like to hear how shortening works too. When I was a kid, we always made the Toll House recipe with shortening, so I should probably give these a try. I think Paula would love the butter sticks. They have half the saturated fat, so she could use double! I had the same thoughts as Sue when I saw “Deen Brothers”. Their momma must be saying “Where did I go wrong?” 😉 $$$ I’m always skeptical about all this stuff as I grew up when everybody thought margarine was better for you than butter. (My family still believed in butter.) They weren’t telling us about trans fats. Ooh, I haven’t seen those baking sticks. I will definitely give this a try. They look yummy! Thanks for trying these! I’ve been wondering how the I Can’t Believe It’s Not Butter baking sticks compared with the Smart Balance Baking Sticks. I’m going to try the oatmeal version soon.